Fresh fruit? Check. Almond milk? Got it. Brown rice? Better grab two. Each week, my grocery list includes a little something extra. Of course, I splurge on treats for myself (hello, chai tea!) and Mr. P (cheers, beer!) every once in a while. But those are not consistent extras. I do, however, routinely add items for my local food bank to my grocery list. In fact, I make it a point to purchase at least one item for the food pantry each week. The why is obvious, but the benefits–both budgetary and otherwise–might not be. First, let’s state the obvious: The economy and the job market are both turbulent to say the least, and homelessness is a sad part of reality. Each year, I’m amazed by the number of homeless students I encounter. Even if people are not homeless, local food banks help provide much-needed meals for those who need it most. Donating to area food banks is important. Donating consistently all year long is even more vital. Our neighborhood collaborates with area churches to put together a huge food drive right before Thanksgiving. The United States Postal Service also hosts a mail carrier food drive in the spring. Previously, I, like most people, would make an extra trip to the store and fill my cart with the most-requested items whenever I learned of these drives. This kindness benefited the food pantry, but not my budget. After a year of this, a solution was staring me in the face: buy one donation item every week. By purchasing a nonperishable donation item every week, I can stick to my grocery budget and support the food pantry year round. 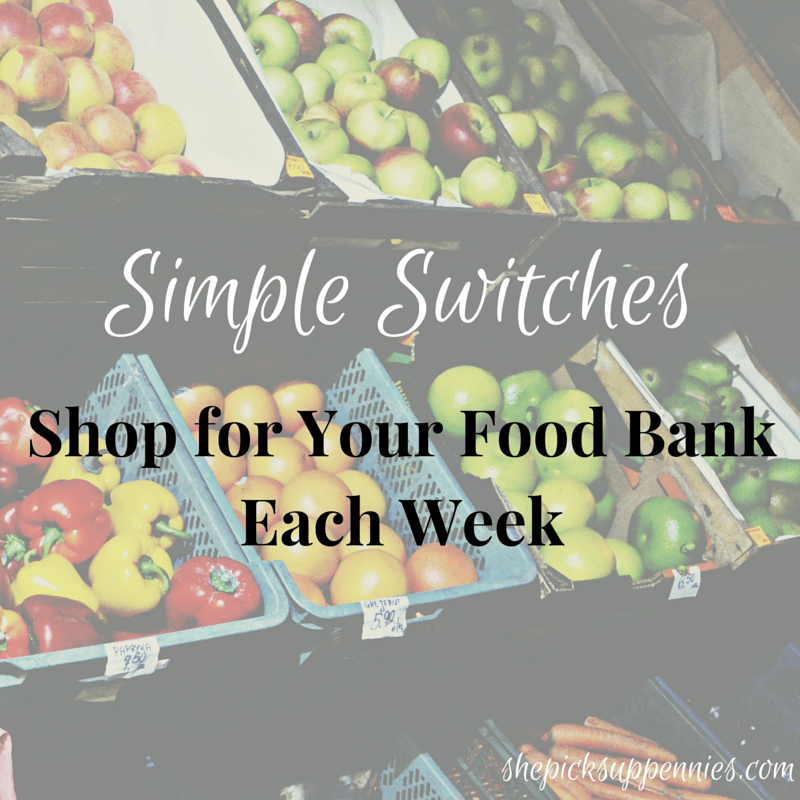 Typically, I will either buy multiples of an item that I scored for a great sale price or I’ll stock up on food pantry staples. While it might mean adding a few extra dollars to my spending every week, I always have the items on hand. That means if a food drive happens, I don’t have to make an extra trip to the store or worry about adjusting my budget. By creating this donation stockpile, I can also help keep my food pantry supplied all the time. Spices – Dietary staples like rice and beans can be bland. Buying garlic powder, minced onion, or cinnamon can add a little zip to anyone’s cooking. Peanut Butter – I’ve waxed poetic about peanut butter and jelly sandwiches before, but peanut butter is a quick and easy source of protein. Open jar, insert spoon, find happiness. Snack Packs – I always try to scoop up tuna and cracker snack packs when I find them. I used to always donate rice, beans, and other items that people — myself included — could use to make a frugal meal. However, I realized that not everyone has easy access to a kitchen. These snack packs make for excellent mini-meals. Feminine Products and Diapers – Um. Hello. These items are ridiculously expensive and essentially unavoidable. I can’t even begin to imagine being in a situation where I had to choose between purchasing food or sanitary items. Of course, every food bank is different. Consult yours here for a list of their most-needed items. When it comes to personal finance and budgets, it is not just about one person’s wallet. No one spends or saves money in isolation. We are all part of communities – local, virtual, global. So when it comes to our budget, we could certainly shave our budget a little more if we crossed the food bank off our shopping list. But giving to others is the biggest gift I can give myself, and I’ll never be able to put a price on that. So Tell Me…What items do you give to your food bank? Would you consider adding donation items to your shopping list? What are your favorite ways to give back to the community? I think this is a really great idea. I do not routinely give to food banks, not because I don’t want to, but because I just don’t think about it. This is a really easy, cost efficient way to add this into your budget. I think I will try it and look for a food bank to give to. That’s awesome to hear that you might give it a try! I Love this! I regularly stock up on toiletries I find on clearance to donate to our local groups. I just unloaded a decent sized bags of shampoos, shave creams and deodorants last night, I love finding a good deal and getting a little extra to give to someone in need. LOVED this post! That’s such a good point about the toiletries. I will definitely have to add this to my shopping lists! I have a coworker who is very involved with a homeless shelter in the city, and I just gave her all my little travel-size toiletries. I always collect them, but when I was decluttering, I realized how absolutely pointless that habit was. Diapers and hygiene items are my top pick since they are in high demand and most food banks around here only get them through donations (although some of the pregnancy and childcare charities do manage to swing some good deals). Most food banks have agreements with organizations like second hand harvest or local grocery chains where they can buy food for about 10% of retail prices, so if I don’t have diapers, I just give cash. I’m glad that those are your top picks, too. They’re so pricey…and absolutely essential! I LOVE this post. It’s so important to think about those who can’t afford the basic necessities, so I’m glad you’re starting this discussion. I’ve volunteered a lot at food banks, and they’ve often said that the best thing we can donate is cash, so we mostly stick to that now. BUT, I always grab the little travel shampoos and soaps at hotels and donate those to a local women’s shelter, and if I’m going to buy something that’s on sale for two-for-one, I’ll grab the second and donate that. These things cost me nothing, and are such a no-brainer. Back in my couponing days, I would do a lot more, since the best deals are had when you buy in massive bulk. I’d sometimes get 10 toothpastes for a dollar, and donate seven of them, for example. We’ve moved away from couponing since it mostly applies to processed junk food, but occasionally if I see a coupon that combines with a sale to make something close to free, I’ll buy it to donate. It’s great to talk to another reformed couponer! Thank you for your kind words about the post. It has served me well, as my school just launched an impromptu food drive this week and I already had a shelf full of items to give. Plus, I figure if even one other person sees this and considers donating at “off peak” times, I’ll have done a little bit of good. I love doing this! If there’s a sale on like pasta sauce or tuna or tuna snackpacks I always pick up a couple more than I need and drop them in the bin as I go out. It’s so simple, translates into savings on my bill too, and it’s helps people! So good! Great post! Your kind heart is clear- and thank you for bringing this issue to more people’s attention and being thoughtful enough to include sanitary products. They can make a huge difference by not ruining other clothing and allowing women more freedom to get around and pursue work without so much worry about taking frequent breaks to check for leaks. I also just reached out to my local food bank to see if they accept OTC medicine. I try to restock our medicine cabinet when I see sales (well before cold season! ), and it occurred to me how horribly expensive that can be!